Is it possible for poetry to be simultaneously raw and elegant, direct and oblique, hurtful and consoling? 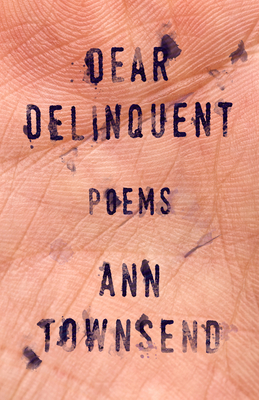 Yes, says Dear Delinquent, Ann Townsend's incandescent new collection. "My heart presses my ribcage like an octagon fist," she writes, taking on the persona of both betrayed and betrayer. Through poems that masterfully recall the styles of Sylvia Plath or Philip Larkin, Townsend convinces us that, even if its most destructive forms, love is the driving force behind all behavior. Ann Townsend is the author of Dime Store Erotics and The Coronary Garden. She is the editor (with David Baker) of a collection of essays, Radiant Lyre: on Lyric Poetry, and is currently at work on a collection of essays on poetry, translation, and the natural world. Her poetry and essays have appeared in such magazines as Poetry, The Paris Review, The Nation, The Kenyon Review, and many others. The recipient of grants from the National Endowment for the Arts and the Ohio Arts Council, she has also received fellowships from the Bread Loaf Writers Conference, the MacDowell Colony, the Virginia Center for the Creative Arts, the Bernheim Arboretum, and the Lannan Foundation. She is the co-founder of VIDA: Women in Literary Arts. In 2016 she, along with co-founders Cate Marvin and Erin Belieu, accepted the Barnes & Noble Writers for Writers Award, given in recognition of their work for the larger literary community. A Professor of English and Creative Writing and Director of the Writing Program at Denison University in Granville, Ohio, Ann Townsend hybridizes modern daylilies at Bittersweet Farm.